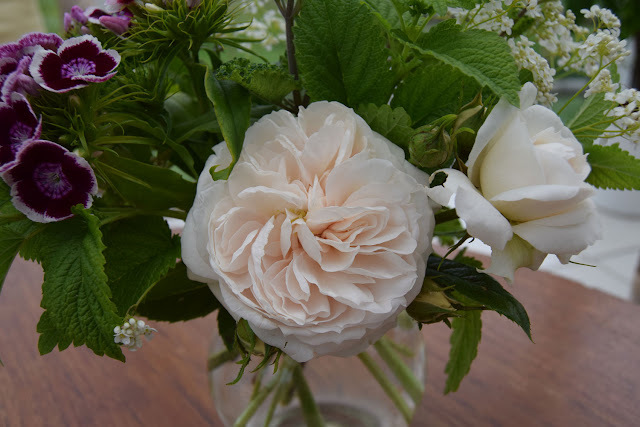 A Blog about Compost: Sweet scents in a vase on Monday. Sweet scents in a vase on Monday. It's a murky start here to our final spring Bank Holiday. Such a shame for people who have organised events. The weather here is still a bit of a roller coaster but it's been a bit more normal. Some very hot days, then storms, then a chilly day, then back to the heat. The garden certainly appreciated the rain although a few things were battered down. So many lovely things to pick, though. As usual scent is important in my choice. Two years ago I sowed some Sweet William seeds and grew them on in pots before planting out. They flowered last year but now there are large clumps everywhere as I has so many I'd put them in wherever there was a space. Some will have to come out but just now they are just coming into flower. This rose has the most gorgeous blush to the centre petals. Also in this vase is this unidentified plant. If you know what it is please tell me. I've never found anyone who knows what it is. It's a bit of a thug really. It runs, you can see it has gone right through here but is very pretty. Some serious clearing out needed in a week or two. 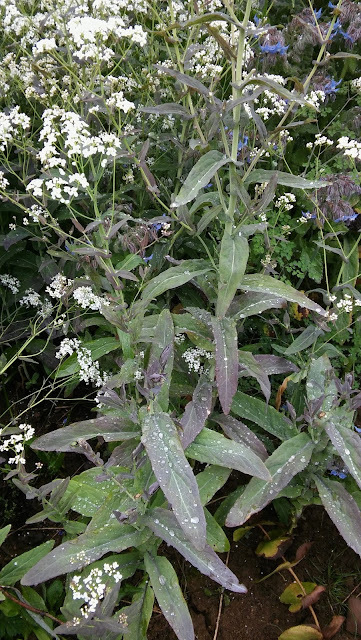 The flowers are quite like cow parsley but the leaves are completely different and purplish. They don't last very long. I'm thinking of creating a border/hedge of thuggish plants which run. It's a new idea so not really formed yet. They could fight it out together. I'm not sure what is wrong with the colour here. It looks a bit odd in my photo. Parsley foliage. I'm just taking out last year's plants which are now enormous. Honeysuckle. I've cut the Sweet William and honeysuckle as they are just opening as I believe they will continue to open and so last longer. Lets hope so. For colourful and creative vases from around the world visit Cathy at Rambling in the Garden - In a vase on Monday. Thanks as ever to Cathy for hosting. 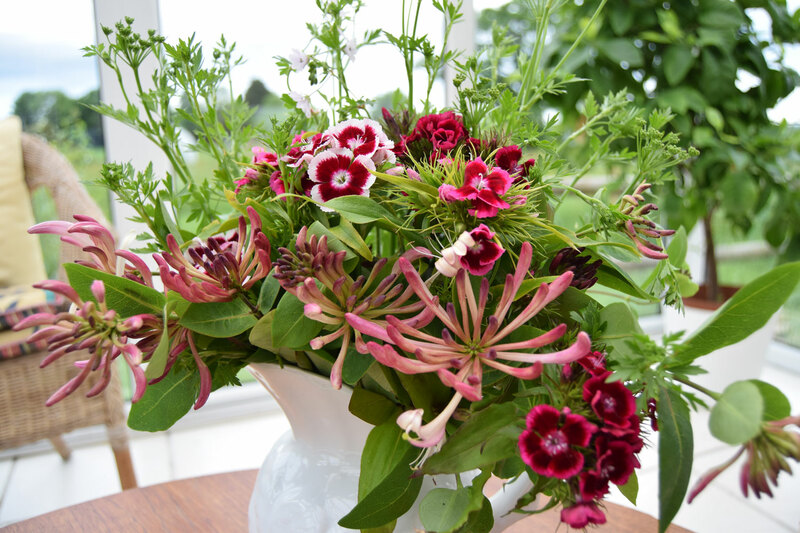 The Sweet william is beautiful and goes well with all you presented. I especially like this last photo. Yummmy. Thank you. The flowers are opening up a bit more already. Sweet William is among my favorite flowers. It looks beautiful in both of your beautiful arrangements. I have Sweet William grown from seed that must be in their third year now and still doing well so I am not complaining. 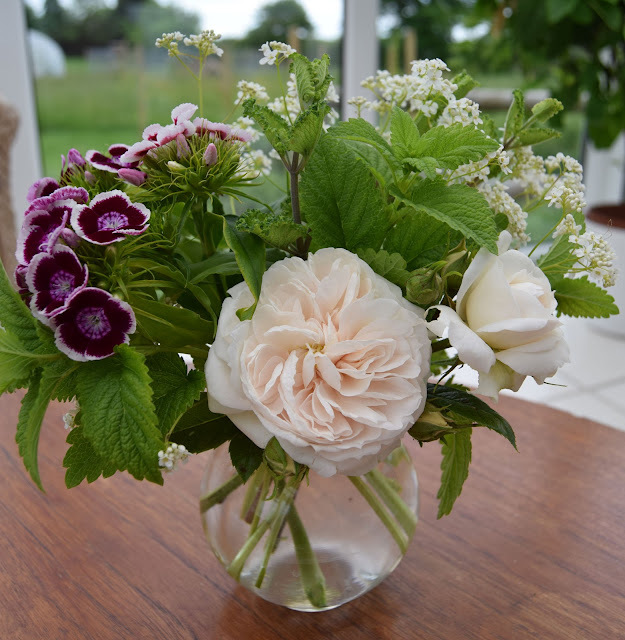 Yours look particularly good in the second vase with the honeysuckle and parsley, but your rose comesa close second! Don't know about your mystery plant - the leaves look familiar but not in combination with the flowers - sorry... Hopefully someone will recognise it. 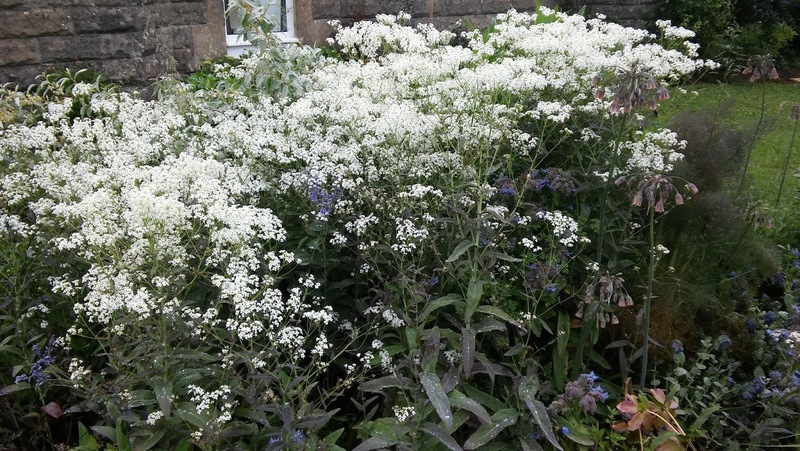 A thiggish border certainly sounds interesting!! They do last a few years before getting rather raggedy. I love the velvety colours in the second vase. Your vases are "scentsational!" Such a nice mix of colors and it must be a delight to the nose to pass these! I don't know where to put my nose in May. Too much choice! My earliest garden memories involve Sweet William in my grandfather's garden. It's always a pleasure to see them. Yours are lovely, esp. paired with R. 'Macmillan Nurse' and honeysuckle. Thank you. I think everyone remembers it from childhood. You've made great use of the Sweet William - I love both vases, Alison. Sadly, the plants don't usually last long here. I planted some during winter but they've mostly died out already. I can't name your mystery plant but it looks like a good filler if you can keep it under control. What a shame it doesn't do well for you. The mystery plant is quite shallow rooted so can be hoicked out. I should have tried a bit harder last month. It is very pretty just now. It's a bit of a silly name for a rose but I suppose it raises funds. No real scent to the mystery plant. Thank you. It's good to know people appreciate them as I do. 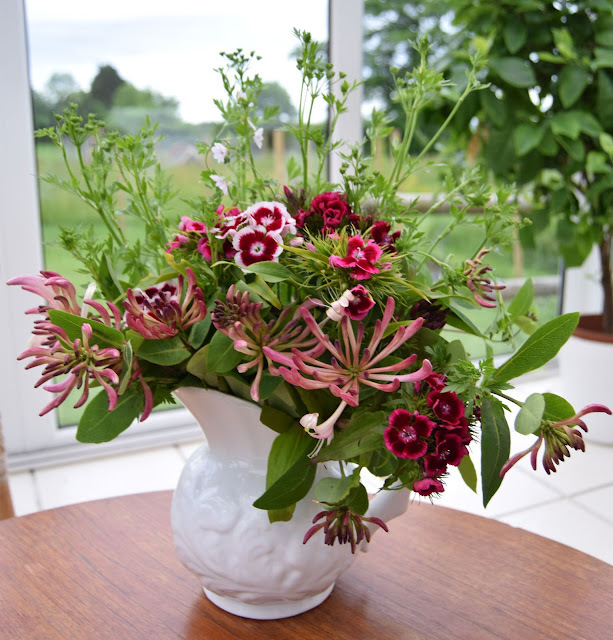 The honeysuckle looks so pretty in a vase, and using parsley as foliage is a great idea. Mine has grown like mad the past few days and I was just wondering how to use it all up! Wnjoy that lovely scent, Alison! Indeed, I think I made soup once but it wasn't a great success! Irises in a vase on Monday. Frothy spring Lilac in a vase on Monday.